Now you will see how the Fireball 2001 really makes $ense by paying for itself quickly! The Fireball 2001 is a high quality system that will be providing your family with hot water for decades. While your family grows, so do your solar savings! You own your home, why rent your energy? produce your own energy and watch the savings grow! from ACR Solar International Inc. Virtually Everyone Can Afford to go Solar! 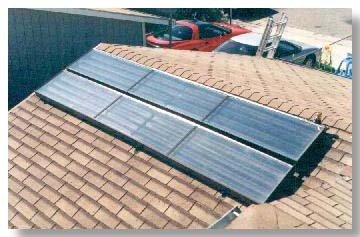 For example, in Phoenix, Arizona, a family of four could save over $266.00 per year with only one panel. Since Arizona provides a 25% tax credit, the system will cost under $750 after the credits! The system will therefor pay for itself in under 3 years (35%)! This is a best case situation thanks to the credits, but most installations pay for themselves in under 6 years which is still an excellent investment! cost was a "show stopper,"
environmentally motivated. We have changed all that! Now Owning Your "Solar Utility" Makes $ense! # of Panels (c) System $ City, State Total 6 Yr.
or other SAFE Investment Returns!! The above savings included the Federal and State taxes you no longer need to pay on Utilities because YOU own your own "Solar Utility". The savings used were 25% but could be from 15 to 35% depending on your situation. Your solar savings include taxes, and charges you otherwise would have had to pay. These additional charges usually add 3 to 8 cents per KWH or 20 to 40 cents per Therm or Gallon. For your true cost per KWH or Therm or Gallon, always divide the TOTAL Utility Bill by the KWh, Therms or Gallons you used and divide the result by one minus your tax bracket, i.e. the % you pay in all federal and state taxes of every dollar earned. Example: $.14 kWh on Long Island, NY + $.02 taxes & charges = $.16 divided by 1 - 30% tax bracket (/ .70) = $.23 true kWh cost X 4,280 kWhs used per year = true $ cost to heat water of $984.00 per year or $984 of purchasing power gone! Oregon Personal Income Tax Credit $.40 kWh, up to $1,000, exp: 1/1/01. CONTINUE TO NEXT PAGE: "Sizing Your System"